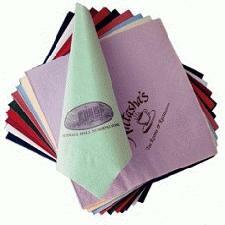 Add the finishing touch to your special occasion with our Napkins with Logo Branding, whether it be a wedding, buffet or whether you wish to gain some friendly advertising in a restaurant or fast-food outlet. You can fully customise these fantastic Napkins with Logo Branding and hand them out in mass numbers. Each time they are used, you can add an inventive print to the napkin - such as a 'lipstick lips' effect with your company's phone number! Great for dining and other functions, be the highlight of the party and gain some valuable exposure with some Napkins with Logo Branding! For a FREE QUOTE, please fill in the form regarding our Napkins with Logo Branding	and we'll be able to help you. And if you would like to view our Promotional Serviettes click here.